"Tomás and her company know their flamenco, yet they're willing to play with its conventions." A Palo Seco is a New York based Flamenco Company that strives to develop a unique voice, employing their Flamenco expertise, while also taking into account the context in which they live. Their work aims to expose people to an innovative way of looking at Flamenco, combining traditional techniques with a modern, metropolitan flare. Run by artistic director and choreographer, Rebeca Tomas, the company debuted its first production in May 2010 at Theatre 80 St. Marks (New York City). The production was described as "a feast for the eyes and the ears" (Linsday Miller, Theatre On-Line), and reviewed by several press sources, including the New York Times. Jack Anderson, for the New York Theatre Wire, wrote, "Tomas is seeking to develop Flamenco in new ways." The company has continued its yearly New York City season at Theatre 80, as well as appearing throughout the U.S. at the at venues such as 2012 the Chicago Flamenco Festival and Jacob’s Pillow. Tomas and company have also been featured as guest artists at the NYC Between the Seas Festival of the Mediterranean in the summers of 2011, 2012, and 2013. 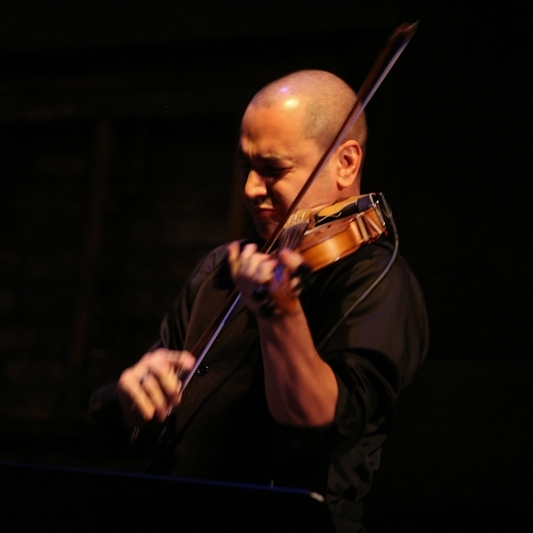 Venezuelan born Alí Bello is a versatile violinist whose music education started in "El Sistema" (The National System on Youth Orchestras of Venezuela). In the mid 90's Alí traveled to New York for college and received Bachelor and Masters Degrees in Music Arts. His talents include classical music, jazz, pop, R&B, middle Eastern, flamenco, and the many styles of South American music. He has recorded, performed, toured, and collaborated with music figures from Tito Puente to Jay-Z as well as performed in Music Festivals in U.S., England, Australia, and The Caribbean Islands. He has played with the Latin Jazz Coalition, the Fania All-Star Band, and Orquesta Broadway as well as leading his own Afro-Latin groups, the Sweet Wire Project, and his Latin Jazz sextet The Jazz Liaisons. From Cuban and Spanish decent, David is a self-taught singer who has established himself in the United States as one of the country's top flamenco singers. He began singing and playing professionally at the age of 20. His worldwide performances include a variety of musical venues and theaters in places such as Mexico, Paris, India, Russia, Puerto Rico and Israel. His talent has led him to perform with great artists such as Pilar Rioja (The Queen of Spanish Dance), Middle Eastern pop fusion group - Alabina, Omayra Amaya, Nelida Tirado and Carlota Santana Flamenco Vivo as well as television spots and commercial compositions. Gypsy by heritage, Pedro Cortés began studying with his father and the esteemed Flamenco guitarist Sabicas at an early age. Touring professionally since the age of 17, he is internationally recognized as a soloist and composer. Cortés has performed and toured with Jose Greco, Maria Benitez, la Farruquita, La Tati, Merche Esmeralda, Manolete and the late Lola Flores. He was guest artist with the St. Louis Opera and the New York Grand Opera, and was commissioned by the Guthrie Theater in Garcia Lorca's Bodas de Sangre as Musical Director. He also premiered his work En la oscuridad de las Minas at the Teatro Albéniz in Madrid. Mr. Cortés is artistic director of his own Flamenco Fusion group Amanecer Flamenco De Hoy, as well as Mimbre Y Vareta and Zorongo Flamenco. Marina made her performance debut at the age of fifteen with Theatre Flamenco of San Francisco and continued with the company for three years. Since then, she has appeared with La Monica's Pasion Flamenca, Maria Benitez's Teatro Flamenco, and Caminos Flamencos, performing in premier venues along the West coast. Since summer 2012, she has performed and toured with the world renown company Soledad Barrio & Noche Flamenca. Marina began training in ballet at a young age and delved into flamenco soon afterward. She began her studies in Spanish classical dance and flamenco with Adela Clara and continued her training with La Mónica and Yaelisa in the San Francisco Bay Area. She has also studied in Sevilla and Madrid with Yolanda Heredia, Rosario Toledo, Concha Jareno and Maria Juncal. Leslie Roybal began her career at age 5 performing with a Mexican folkloric dance company. After earning a BFA in Theater from Stephens College, she continued her dance education at the University of New Mexico where she studied Contemporary Dance and Flamenco. Proficient in both dance styles, Leslie has performed in New York and throughout the U.S. with companies such as Murray Spalding Mandalas, Fred Darsow Dance, Neville Dance Company, The Metropolitan Opera (in Carmen and La Traviata as well as on tour in Japan), and Flamenco Vivo Carlota Santana. Last year, she worked with renowned dancer/choreographer Rosario Toledo in Philadelphia's First Flamenco Festival and with Angel Muñoz Flamenco Vivo's Annual Tour of the Boros. Apart from performing, Leslie leads lecture demonstrations, conducts workshops and Master Classes and gives lectures within the Contemporary Dance and Flamenco ideologies. Sol "La Argentinita" was born in Buenos Aires, Argentina, later relocating to New York City where she began her Flamenco career, performing and touring with numerous Flamenco dance companies. She has appeared with the Metropolitan Opera for the past two seasons in Zeferelli's production of La Traviata, as well as at the Town Hall for the World Music Institute 20th Anniversary Celebration. From summer 2008 through winter 2009, she danced with the internationally renowned company Soledad Barrio and Noche Flamenca in numerous tours and productions, sharing the stage with figures such as Soledad Barrio, Alejandro Granados, and Alfonso Losa. Sol is a two-time recipient of the Cristina Heeren Foundation scholarship as well as a recipient of the Jerome Foundation's Travel and Study Grant and a scholarship from the school at Jacob's Pillow. Her solo piece Soleá, received critical acclaim by TheatreOnline.com and The New York Times. Sol teaches classes for children and adults in NYC, including residencies with Alvin Ailey and Young Audiences. From Venezuelan decent, Bárbara Martínez started performing at age eleven and has appeared with Gazpacho Andaluz, Oscar Valero Flamenco Dance Company, Andrea del Conte Danza España, Sol y Sombra Dance Company and Flamenco Sepharad. Bárbara has toured with premier flamenco guitarists Pedro Cortés and Juanito Pascual and has sung for Pilar Rioja (Spanish Repertory Theater) and Marco de Ana (Joyce Theater). She danced in The Metropolitan Opera in Zeffirelli's productions of Carmen and La Traviata and at Town Hall for the World Music Institute 20th Anniversary Celebration. Recently, Bárbara taught for the Cirque du Soleil and presented a solo concert in the Weill Hall at Carnegie Hall. Born into a family of famous flamenco artists Estrella Morena (dancer) and Pepe de Málaga (singer), Jose began his flamenco career at age 6 under the guidance of his parents. After his debut at the famous Tablao Costa Vasca in Miami, Jose continued his studies with the Great Manolete, Farruquito, and Andres Marin, studying Cajon with Manuel Soler. Jose has worked with distinguished artists such as The Great Manolete, Joaquin Ruiz, Pastora Galvan, El Pecas, Jose Cortes “Pansequito”, Isabel Pantoja, David Bisball, Omayra Amaya, and more. In 2001, he choreographed and performed a collaborative work with his mother Estrella Morena, appearing with the renowned flamenco singer Carmen Linares and the New World Symphony Orchestra at Lincoln Theater in Miami. He has also appeared at the annual Panama Jazz Festival and at Carnegie Hall in New York City. Elisabet Torras Aguilera was born and raised in Barcelona where she earned her BA in Spanish Dance and Flamenco from the Conservatory of Dance and Theatre. She continued her studies later in Madrid. Her training was always focused on Flamenco, Classical Spanish dance, Escuela Bolera, Spanish Folklore, Emma Maleras Castanets Method, Ballet and Contemporary Dance. Elisabet has toured Europe and Asia with Zarzuela, Flamenco and Classical Spanish Dance companies. In 2009 she was invited as a guest artist for the Flamenco Festival “Viva España” in Moscow and the “Presidence Belge”-Festival in Brussels. She toured Spain and China with Flamenco pianist Manolo Carrasco’s company, performed several seasons with Javier Latorre’s Somorrostro Dansa Flamenca Company and danced for Rojas & Rodriguez Company in Madrid in 2011. Since 2013 Elisabet performs in New York City and the TriState Area with NY based Flamenco companies “Flamenco Vivo Carlota Santana”, “American Bolero Dance Companny”, “A Palo Seco”, “Soledad Barrio & Noche Flamenca” and Latin Grammy Award Winner Hernan Romero. Elisabet participated as a Solo Castanet player for Dance Heginbotham, Opera Singers Anna Tonna and Larissa Martinez, as well as different classical orchestras, chamber orchestras and smaller classic ensembles dancing Escuela Bolera and Spanish Classical Dance. Elisabet has taught in Madrid, Barcelona, Moscow’s Flamenqueria - a institute dedicated to Spanish tradition in Russia, and now here in New York City.